That's why Greentech Media landed in San Francisco last week to explore California's Distributed Energy Future (CDEF) with 300 of our industry colleagues and friends. CDEF focused mostly on the decentralization piece and the role of distributed energy resources (DERs). A video archive of Shayle's presentation (and the entire CDEF event) is available for GTM Squared members. A highly distilled version of his talk follows. Kann stressed that that this transformation should not be framed as utilities versus decentralization. In fact, utilities are embracing the change and investing at a strong pace -- with $3 billion put into DER companies so far, and $1 billion invested in 2016 alone. 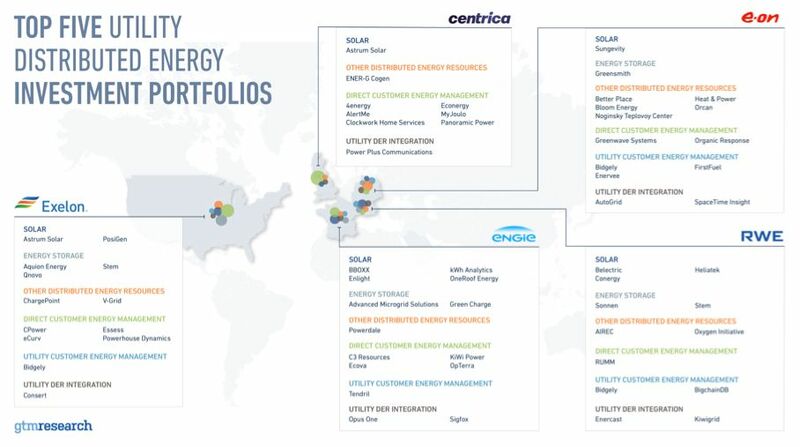 Most of these investments go into the "direct customer energy management" bucket. These are technologies and services that are sold directly to residential or commercial customers, such as load control devices, demand response services and energy efficiency measures. "Utilities want to maintain the customer relationship and serve their customers better if they can, so they're investing in direct customer energy management solutions," said Kann. Utilities are also investing in distributed solar. 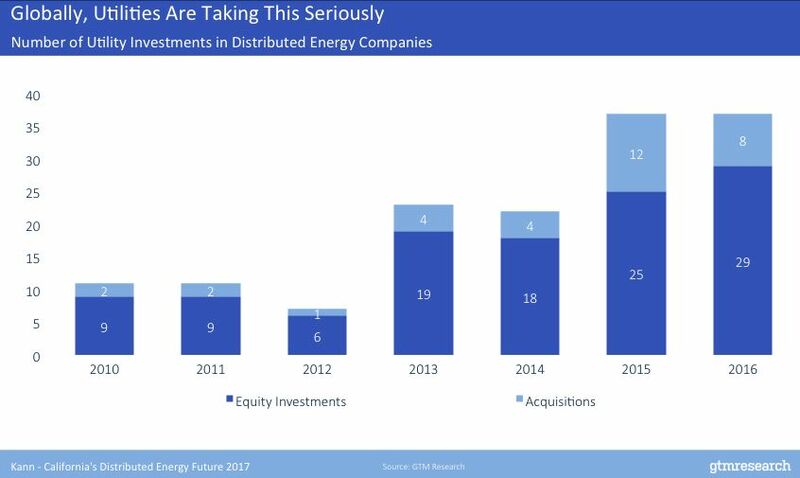 "You've seen a lot of utilities and their affiliates investing in...[and] unregulated subsidiaries of utilities buying distributed solar companies." So far, this has been utility affiliates buying commercial solar developers. "For example, Edison International bought SoCore, and is wrapping it into Edison Energy, their newly formed group to offer a broader suite of customer energy management solutions to large customers." "Duke Energy bought a commercial solar developer. NextEra Energy bought a commercial solar developer. AES just bought a commercial solar developer. So, this is clearly a trend within the U.S. Energy storage is also emerging here as well. If we're going to be putting a bunch of behind-the-meter energy storage on the grid, utilities want to play a role in that." Distributed energy resource management systems, or DERMS, constitute another area in which utilities are making a significant number of investments. Four of the five utility affiliates with the broadest DER portfolios are European. Kann said, "It's worth noting that European utilities are ahead of the game here, relative to North American utilities. Distributed energy is a little bit more mature in Europe than it is in the U.S. Germany was the first big residential solar market, for example. It's got a much longer track record there than the U.S. does." 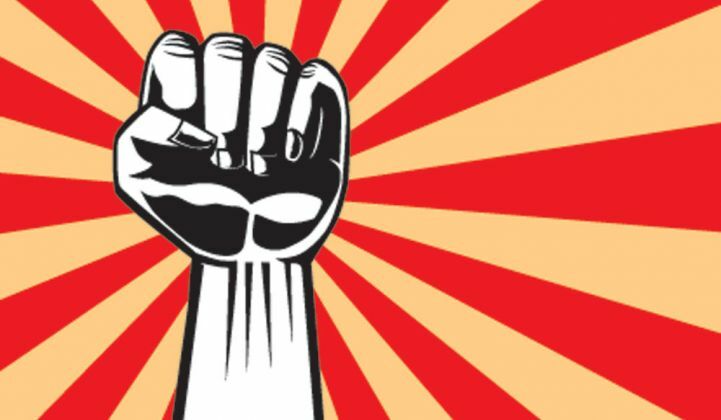 "Solar is not the entirety of distributed energy resources...but I honestly do not think we would be having this conversation if it weren't for the fact that we've had such a boom in distributed solar in the U.S. That acted as...the tip of the spear for a lot of these conversations about dramatic transformation," said GTM's research leader. "2016 was by far a record year for solar in the U.S. We installed almost 15 gigawatts of solar in this country. That's up 95 percent over 2015. So, the market basically doubled year-over-year." Much of this boom was expected, and part of the rush was to earn an expiring federal Investment Tax Credit that ultimately ended being extended. Most of that was utility-scale. "Distributed solar in the U.S. did grow last year. The residential solar market did grow about 19 percent. Commercial solar market actually grew closer to 50 percent. But, it's still dwarfed by how much centralized solar we're putting on the grid. That's probably going to remain true for the next couple of years." 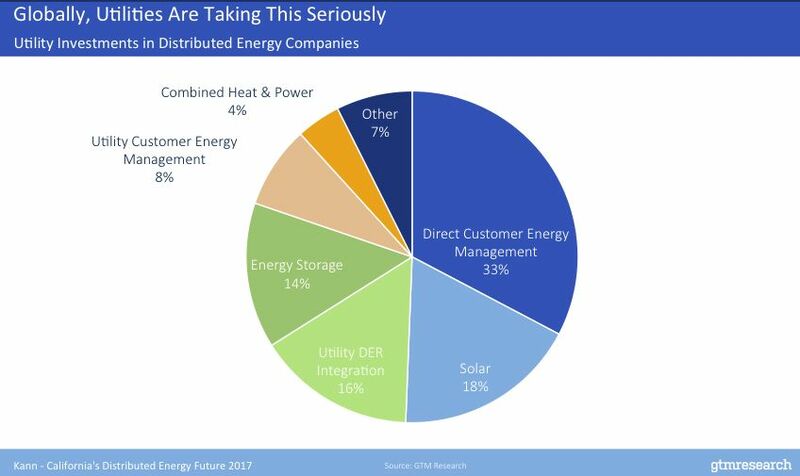 But Kann raises this question: "If decarbonization is your primary goal, does that necessarily mean you need a ton of distributed energy?" He suggests, "You might. You might want both. But, as it exists today, most of the decarbonization that's occurring in the U.S., and this is also true globally, is coming from large, centralized renewable energy generation." 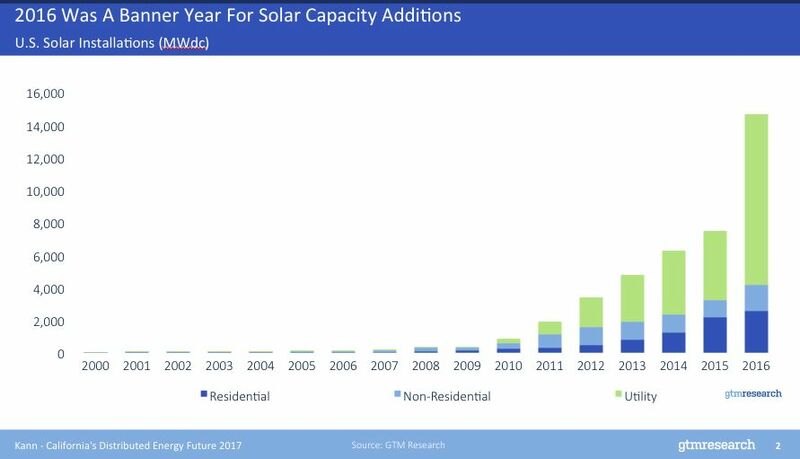 But despite that, distributed energy is growing pretty fast in the U.S.
We have 1.3 million solar customers behind the meter in the U.S. today -- that's residential and commercial customers who have operating solar projects on their roof or on their property. We have about 1,900 behind-the-meter energy storage installations. Obviously, that's a much smaller number. It's still a nascent market, despite all the attention we pay to it. But it's growing at a fairly rapid clip, and that's a much bigger number than we had in 2015. We have about 570,000, almost coming up on 600,000, plug-in electric vehicles that are hitting the roads today, all throughout the U.S.
"California is consistently a leader across technologies. California represents 49 percent of all the distributed solar that's been installed in the U.S. It represents 49 percent of all the distributed storage that's been built in the U.S., it represents 47 percent of all the plug-in electric vehicles in the U.S." California is also a leader in advanced metering infrastructure, smart thermostats and fuel cell deployment. "But, the reason why California is so important in addition to just being a leader is that what happens in California will certainly reverberate through the rest of the country. It's impressive to see how explicitly folks in other states and at the federal level are willing to say that." "Here's an example. Acting FERC Chairman Cheryl LaFleur, in reference to distributed energy resource aggregation, said, "We'll be closely watching California, which now has five DER aggregators signed up. We're figuring out how they integrate them into their market, and can probably learn from that in order to decide how far to go." "This is a FERC commissioner at the federal level basically saying, 'Well, we're going to watch California.' So that places a lot of pressure on what happens in this state. It means if we get it right here, you could imagine [the same model being duplicated] in other parts of the country. If we get it wrong, it might set the rest of the country back." In November the California Public Utilities Commission published its California DER action plan. "It's a super valuable guide if you are getting lost in the weeds of everything that is happening in this transition. It's on the CPUC website, and I highly recommend it to anybody who hasn't checked it out." "The other thing I like about it is that it basically frames all the myriad issues that we're dealing with in three buckets. I think it's a useful frame for the conversations that we're having today. "The first bucket is rates and tariffs. If you're going to be putting a lot more distributed energy on the grid, you have the big question of how you charge customers for electricity. How do you change the rates that have been largely generally flat -- not locational, not time-based? How do you make rates reflect...cost of service? How do you make them enable distributed energy resources to find the places where they will have the most value? And, similarly, tariffs, when you are feeding power back in to the grid from a DER technology, or when you are saving power, or when you are shifting load, how does that get compensated?" He continued, "The second is a bit of a mouthful. It is distribution-grade infrastructure, planning, interconnection and procurement. This one basically says we have one system, or we have historically had one system for thinking about the distribution grid, planning for it, making sure that it remains reliable and operational and trying to do so at least cost." Kann went on: "The third category is wholesale DER market interconnection. Say you fix the other two things -- you still have this opportunity where there's a wholesale market...and you have all these new distributed resources that are very small. They're too small individually to play in this wholesale market, but when aggregated, there's interaction there. They can potentially...be able to drive some value from the wholesale markets. 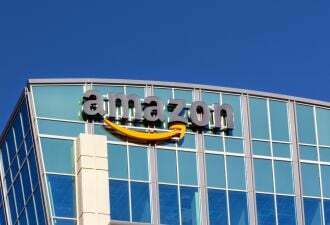 They should also be, in some cases, optimized to when the wholesale market is sending them a signal that there is a need." As Kann acknowledged, "This stuff is really complicated. [...] One way to...show the complexity of all this: That California DER action plan that I mentioned. It's easily the best document that I've read about what's happening in California; it's the simplest, most straightforward thing you can possibly find to see all of the different regulatory activities that are going on. It's 10 pages, which is impressive -- they were able to fit all of that into 10 pages. But the 11th page is an appendix that has a list of 73 acronyms [used in] the first 10 pages. [...] When you have a 10-page document that requires 73 acronyms, that's a sign that the market is pretty complex." Do distributed energy resources reduce emissions? "There's another question that relates back to the decarbonization component to this, which is whether distributed energy resources reduce emissions. You might think that they do, and certainly a lot of the DERs that we talk about, they seem like they would inherently reduce emissions. "Energy storage is a good example of this (and this is going to be slightly unfair, so I'll put a big caveat on it, but I just want to use it as an example). 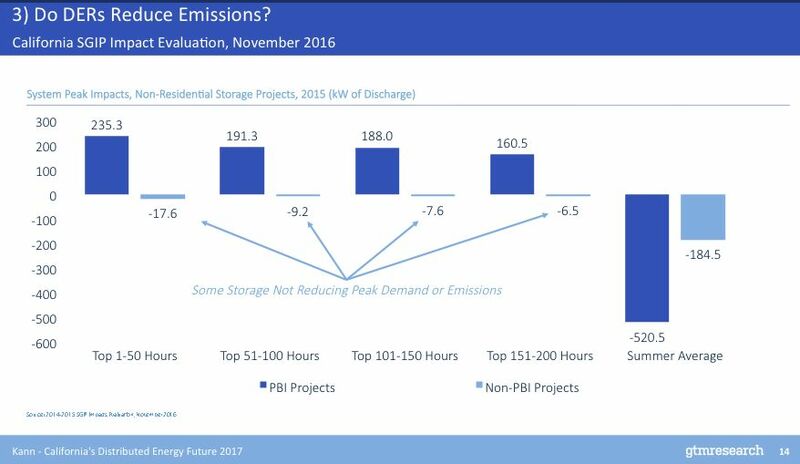 In November, there was the first impact evaluation of the Self-Generation Incentive Program in California, which supports energy storage behind the meter. One of the things it looked at is, during the system peak, the times when the system is peaking, the top 100 to 200 hours of the year, are those energy storage systems charging or discharging? "Now in a world where your goal is to reduce emissions, the answer should be obvious. Storage should always be discharging at system peak. What you want to do with energy storage is deploy it at the times when you can reduce peak generation. And that was indeed true for the performance-based incentive projects. But the non-PBI projects, in aggregate, were charging during peak hours on the system, which is exactly the opposite of what you would want if your goal is to reduce emissions using energy storage," he said. This was from "an early wave of projects, 2015 energy storage projects, of which there are very few. In addition to that, it had to do with how the incentive was structured and how demand charges are structured. A lot of these systems are being implemented to reduce customer demand charges. If you don't design the demand charges so that they align well with system peak, then you might end up with a situation where, for the customer, it's more economic to charge during a peak hour despite the fact that it doesn't make sense from a system perspective," he said. Kann continued: "So this isn't to say it's going to continue to be this way for SGIP projects in California, but I do think it's just emblematic of the fact that you need to be thinking about what you're trying to optimize for and then designing each one of these individual programs and acronyms to get to a place where you're achieving the ends that you are trying to reach." "Nowhere else in the country is it as clear that the decentralization trend is real and not going anywhere than in California. It doesn't seem inherently obvious to me that everywhere will go through this transformation, but California certainly will." "There's an interesting contrast between the two states in the U.S. that have taken this transition most seriously, California and New York. New York has this REV initiative that's generated a ton of attention, and California has the acronym soup, and so in some ways, they're heading in the same direction, but I think they've come at it from sort of opposite angles." "New York started with a pretty simple and straightforward vision statement. REV was launched with lots of fanfare, saying, 'Here's what we intend to accomplish out of all this.' Then it spent the past three-plus years trying to implement that vision, and at every step of the way, [they're] discovering more complexity. And so REV keeps getting wider and wider and just running into little roadblocks along the way, and so I think there's actually been a fair bit of frustration. Not to say that REV won't ultimately be successful in New York, but players in the market there are a little bit frustrated with how the process is going today, because it feels like every time they take a step forward, they take another step back." "California's sort of gone the opposite direction. 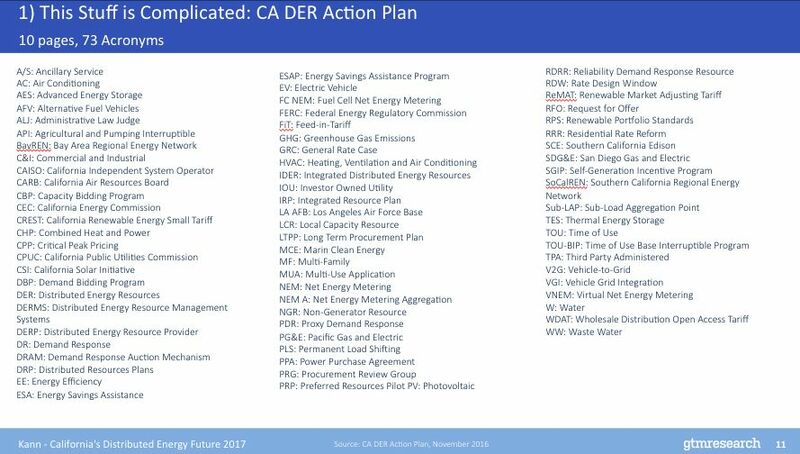 California quietly built up all these individual little components of a distributed energy transformation and then eventually tied it all together into...the cohesive vision that we are building toward within that. It doesn't necessarily mean that California's going to be more successful in that endeavor, but I think in some ways it is a little more positioned for success as a result of having done a lot of the complicated, hard work earlier and then building it up into a bigger picture."